Jason Priestley took to Instagram to share a touching tribute to his late friend and former "Beverly Hills, 90210" co-star Luke Perry, who tragically passed away on Monday. 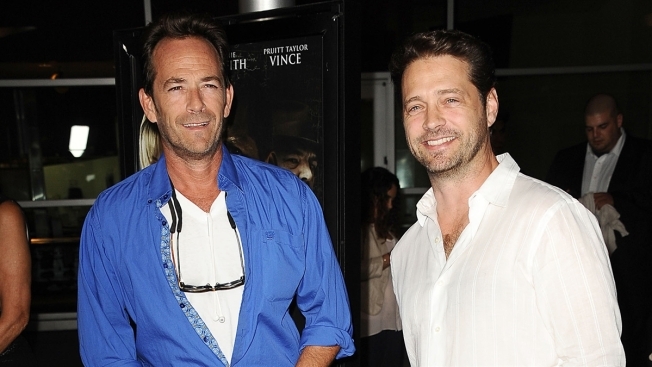 Jason Priestley paid tribute to his friend of over 30 years and former "Beverly Hills, 90210" co-star Luke Perry Thursday on social media. The Instagram post was Priestley's first public comments following the death of Perry, who died earlier this week following a massive stroke. Perry was 52 years old. "It’s taken me a couple of days to figure out how to write this... My dear friend of 29 years, Luke Perry, was one of those truly special people who really cared... Luke was not only a star, he was an incredibly bright light that was extinguished far too soon... and that is why I, and so many others, are in so much pain today," Priestley wrote. He added, "If you had the good fortune to know Luke, or to have ever crossed his path, I know you are sad today as well... the candle that burns twice as bright only burns for half as long... you burned oh, so brightly Luke... Goodnight Sweet Prince." A number of Perry's former "Beverly Hills, 90210 co-stars, including Shannen Doherty, Ian Ziering, Jennie Garth, and Tori Spelling have spoken of their grief following his death.